With assistance from Minjar Cloud Solutions, a Premier Consulting Partner with Amazon Web Services (AWS), Aditya Birla chose AWS due to the cloud provider's ease of use and rich array of services that could be adopted to optimize the performance of its online store. The abof online store launched in late 2015, with the IBM technology stack powering the e-commerce service all-in on AWS. The store infrastructure operates in the AWS Asia-Pacific (Singapore) Region and uses multiple Availability Zones for redundancy. 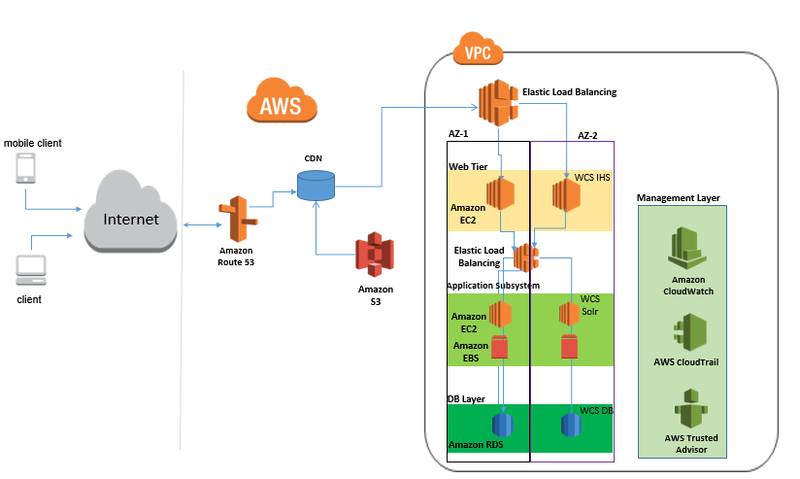 Amazon Elastic Compute Cloud (Amazon EC2) instances run the IBM WebSphere Commerce Suite that enables customers to shop on an ABOF website compatible with fixed or mobile devices, or using an ABOF mobile application. An IBM DB2 relational database that runs e-commerce store-related datasets also runs in Amazon EC2, while a MySQL database that manages datasets for an in-house-developed logistics management system runs in Amazon Relational Database Service (Amazon RDS). Amazon Simple Storage Service (Amazon S3) stores content such as product images and videos, while Amazon CloudFront improves the website’s performance by distributing content to users with low latency and high data transfer speeds. Aditya Birla also uses Amazon Elastic Block Store (Amazon EBS) to store Amazon EC2 instance and web server logs. An Advanced Partner of the AWS Partner Network (APN). Minjar helps in setting up and managing cloud infrastructure for enterprises who want to realize the full power of Amazon Web Services. For more information about how Minjar can help your company build and manage your AWS environment, see Minjar’s listing in the AWS Partner Directory. To learn more about how AWS can help your websites and website hosting, visit our Websites & Website Hosting details page.